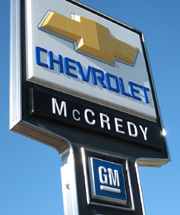 PENN YAN—McCredy Chevrolet is joining the nationwide list of closed General Motors dealerships. As of Saturday, Jan. 23, McCredy had written the word ‘CLOSED’ on his dealership office door in Penn Yan along with posting a single sheet of white paper briefly explaining the details. The 1,100 GM dealerships are only part of the restructuring program initiated by the automaker. GM maintains that by reducing the number of dealers, they will increase dealer profitability and allow remaining dealers to be more competitive with other car manufacturers. GM filed for bankruptcy June 1. The company has since received $50 billion from the United States government to continue operations. The dealer cuts were part of the overall company restructuring program. The auto giant also consolidated car brands and sold off other brands. McCredy says he will join the Simmons-Rockwell dealership in Bath as of Feb. 1, 2010.